A group of golfers is swapping desert conditions in the Persian Gulf for the links experience on the Moray Firth to compete in a prestigious Pro-Am tournament over three of Scotland’s finest courses. Two teams from Doha Golf Club in Qatar have joined the field for the annual Highland Golf Links 54-Hole Pro-Am Sponsored by Blue Group which will be held from 2-4 October at Castle Stuart Golf Links, Royal Dornoch Golf Club and Nairn Golf Club. It is the first time players from Doha – who are used to playing in 45C temperatures – have signed up for the Tartan Tour event, which this year has also attracted teams from Portugal and Ireland as well as from across the UK. Some 250 golfers have so far committed to playing the event, which is being sponsored for the second year by Blue Group, and is again heading for a capacity field. The competitors will play on successive days at Castle Stuart, home of the Scottish Open on four occasions in the last seven years; Royal Dornoch, which hosted the Northern Open last year as part of celebrations to mark 400 years of golf being played in the town; and Nairn, which has previously staged both the Walker Cup and Curtis Cup. All three courses are members of Highland Golf Links (HGL) which promotes Play and Stay golfing breaks in the region. Fraser Cromarty, chairman of HGL, said: “Since its inception in 2013, the Pro-Am has grown steadily in popularity and it is attracting players from far and wide, as the contingent from Doha this year demonstrates. “We have enjoyed some glorious weather for the Pro-Am in previous years, although perhaps not 45C temperatures. However, the Moray Firth’s micro-climate, which ensures we get less rain and more sunshine than much of the rest of Scotland, helps to make it a great place to play links golf. 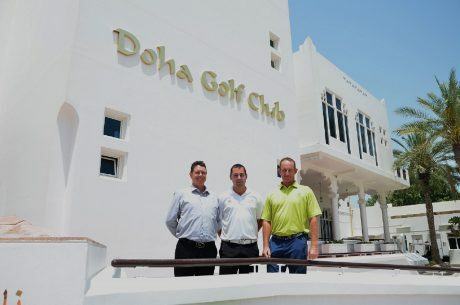 The Doha contingent includes Gary McGlinchey, club pro and general manager at Doha Golf Club, which hosts the Commercial Bank Qatar Masters. He said: “The Highland Golf Links Pro-Am provides me with a great opportunity to showcase my home country, Scotland, to good friends who think they know lots about golf. Robin Doodson, Doha’s course superintendent, who is originally from Glasgow and started his career at Turnberry, said: “I am looking forward to returning to some of the great links golf courses of Scotland where my career began. I jumped at the chance to play in the Pro-Am as the line-up of courses is truly fantastic. “It will be the end of summer in Qatar in October and temperatures will still be ranging around 45C (110F) so it will be nice to have a change. Other members of the group include PGA professional Jordan Massey, who began his pro career in Cheshire, as well as Welshman Jason Smith, and South African Ruan Jordaan. And Ruan added: “Going to Scotland with great mates to play a game I’m obsessed with is, for me, comparable to a religious pilgrimage which every man has to make at least once in his lifetime. “Although I grew up on the coast playing a lot of my golf as a junior on links courses and conditions, I am very excited to try my hand at the real deal and experience Scotland in its fullness. The Pro-Am is estimated to generate about £200,000 for the Highland economy, with other HGL partners – the Kingsmills Hotel and Culloden House Hotel, Inverness, and the Royal Golf Hotel in Dornoch – all benefiting from late-season bookings. Blue Group, who supply world leading material-handling equipment for the quarrying and waste recycling industries, agreed a three-year deal with HGL to support the Pro-Am. This year it will also include a ‘skins’ game on each course. Organisers have also confirmed that broadcaster Dougie Donnelly will compere the prizegiving ceremony. Blue Group director Austin Carey said: “We are delighted to be headline sponsor of the Pro-Am and to see it going from strength to strength.